I am blessed with great neighbors. We wave and chat when we see each other, we bring our newspapers in for each other when we know someone is away and we all get along in, well, I must say, a neighborly way. We don’t really socialize with each other that much but we are aware of how most of us are doing and the general goings on in our busy lives. An older couple who lives nearby has a great porch that has a beautiful navy blue and white striped awning and we all hang out there from time to time, catching up on the latest happenings in our beautiful ‘hood. This almost always includes someone mentioning the most recent selling price of some house that was on the market and the latest frustration or political scandal in the DC government. It’s a lively mix of people and topics and it all blends together in a friendly way. In front of this neighbor’s porch, is a lovely butterfly tree that was planted eight years ago when their youngest son died from brain cancer. Every year it grows a little taller and a little wider, thriving in its special spot for all to see. This past weekend, while I was sitting and chatting on their porch, we were talking about the condition of my neighbor’s back which was just diagnosed as spinal stenosis. 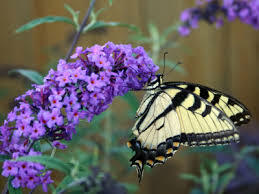 He was going on about the shots he has been getting in his back to ease the pain when a butterfly appeared and circled close to the bush blooming with dozens of small purple flowers. We quietly watched the butterfly for a few minutes. Then my neighbor’s wife quickly opened the front door and came out to join us on the porch.